31st March 1823 On Monday the 31st March, 1823, I set out with my people for the settlement of Bathurst. In the afternoon we crossed the Nepean River, and encamped at the foot of the Blue Mountains, about two miles beyond the settlement of Emu. At daybreak of the 1st April we resumed our journey over the mountains. Upon reaching Springwood, about noon, we rested our horses awhile, and then continued onward until sunset, when, having travelled twenty-four miles, we halted, and pitched our tents at a swamp, which afforded us abundance of tolerable water, although the supply of grass or herbage for our horses was exceedingly small. The thermometer had a considerable range in the course of the day. At six A.M. the mercury stood at 66°, at eleven at 83°, from which it fell at seven P.M. to 68°. Much rain fell in the course of the night. The morning of the 2d, however, although a little cloudy, had every appearance of a fair day. The thermometer, at seven A.M., when we continued our journey, showed 70°, rising to 75° at three P.M., when we reached Blackheath, another day’s stage. A southerly wind, that had been blowing fresh all the day, at length brought up some heavy black clouds, which, in passing to the N.W., drenched us with ruin, ere we could pitch our tents. At night again, heavy rain, with thunder and lightning, set in for the night, continuing with alarming fury until daybreak of the 3d, when the storm partially subsided, leaving me, however, undetermined to advance, since frequent showers were filling, and a thick mist covered the whole of the mountains in the vicinity. About eight A.M. the thermometer stood at 59°, and the clouds breaking to the westward, I was induced to make an effort to reach Cox’s River in the course of the day. The air was exceedingly moist and raw, and every way disagreeable for travelling. We descended the pass without accident, and arrived at Cox’s River early in the afternoon, when I again rested my horses for this day, having in view a fatiguing stage to-morrow, that would occupy the whole of that day. The thermometer was stationary at 60° throughout the afternoon, falling 2° at eight P.M.
4th April 1823. The morning was exceedingly cloudy, and much rain fell in the hilly range before as to the Fish River, which we crossed at two P.M.; and upon advancing four males beyond it, to Emu Valley, we encamped for the flight, when rain again set in, with a fresh S.E. breeze. 5th April 1823 Saturday. Raw, moist atmosphere; wind at S.E. ; the thermometer, at seven P.M., was 59°. Having despatched my cart and pack-horses on their last stage to Bathurst, I rode forward, in order to reach that settlement early in the forenoon, to secure a ration of fresh beef from His Majesty’s store for myself and people, who did not arrive at the plains until sunset. 6th to the 14th April 1823. The weather has been between these periods extremely unsettled and variable. 14th April 1823 On Monday the 14th, I superintended the packing of my provisions, reducing my heavy luggage to pack-horse carriage, and issuing to each of my five men a complete suit of warm winter clothing. Map of the Country between Bathurst and Liverpool Plains. 15th April 1823 Tuesday, 15th. Morning very foggy, with every indication of a warm day. Took my departure, from Bathurst with five heavy laden pack-horses and five men, with provisions for ten weeks, purposing to explore the country north from the Cugeegong River, as far as the extensive clear tracts of level land called Liverpool Plains. The vegetation of the line of country to the Cugeegong River (whose left bank we reached in the afternoon of the 18th) assumed a very different appearance from that which I observed in November 1 last. Few plants were in flower; but the late trains had caused a great exuberance in those species, that clothe the lower lands and are generally valuable to the grazier. Having crossed the Cugeegong at my old ford, I pitched the tents on a flat, upon its right bank, which, from the near approach of the hills to the river, afforded me greater security for my horses. Weather clouded, with a thunder squall to the westward in the afternoon. 19th April 1823 Saturday, 19th. A very fine morning. Since it is very probable that I may, in my return from my proposed long tour, penetrate through the broken mountainous country to the eastward of my present encampment, whence the Cugeegong derives its origin, I have determined to trace the river upwards to a small cleared flat, void of timber, named the Plain of Daby, in order to make such observations upon the country as will be useful to the colonial government, and enable me fully to recognize certain leading features of it, should I be obliged to return southerly through it to Bathurst, at the close of this journey. I accordingly retarded the Cugeegong, directing my people to proceed forward with the horses up its left bank. Steep, abrupt hills, inclining sharply to the water, soon, however, obliged me to quit the river altogether in search of a better and more moderately rising country for my heavily laden beasts. At length, after pursuing a route varying S.S.E. and E. for four hours, I found it only possible to proceed forwards by climbing a main range, from which I found all the minor rocky hills diverged. About four P.M. a favourable and easy descent induced me to quit the range, when I soon entered the valley discovered last year, crossed the pretty swamp-oak creek that runs through it, and in an hour I got among my old marked trees, leading me to the junction of the creek and the Cugeegong River, as well as to the spot where I had forded the latter last December. As the day wea dosing in upon me, and my horses were much fatigued, I halted on a flat near the river for the night, sending three of my people up, the stream, in search of a safe shoal, to lead the pack-horses over, to the north or right bank. The night, throughout was very chilly, although my thermometer continued stationary at 46°. 21st April 1823 Monday, 21st. Morning foggy. Thermometer, at seven A.M. 46°. Resuming our journey easterly, we pursued our route as near the bank of the river as the rocky hills, clothed with an uninteresting brush-wood and callitria pyrimidalis, would allow us, occasionally passing through some grassy valleys, thinly clothed with, a stunted timber of the few ordinary kinds of eucalyptus. The Cugeegong, in these stages of our ascent, presents some pretty, basins of deep stagnant water, from which it occasionally dwindles to a small glassy creek, whose channel is wholly choked up with reeds (arundo phragmites) and typha minor. Grossing at one of these narrows, our course was E.N.E. over a fine grassy country, occasionally seeing the river meandering below us; when, having effected twelve miles, and rain again foiling, we were induced to encamp on a fine reach of the Cugeegong, about four miles west of the plain of Daby. In this day’s stage I observed no signs of inhabitants, and no animals of any description. Granite is frequent on the hills and in the bed of the river; limestone being also abundant on the higher lands, as well as on the immediate banks of this stream. 22nd April 1823 Tuesday, 22d. Heavy rain continued throughout the fore part of the day, obliging us to remain within our tents. In the afternoon, I sent two men to the eastward, to a swamp observed from a ridge in the route of yesterday, and suspected to be the flat named by the natives Daby. In the evening they returned, reporting that they had crossed the plain, or flat, which was about three miles and a half distant from our tents, and that on the western edge of it an extensive grazier, residing at Bathurst, had recently erected a hut and stock-yard. The wind continued fresh from the east, with exceedingly clouded weather. Thermometer, at eight A.M., 52°, and at four P.M. 55°. 23rd April 1823 Wednesday, 23d. Much wind during the night, and cloudy weather continued this morning. At eight A.M. we proceeded E.N.E. through a timbered grassy country about four miles, when we entered the open bare lands of Daby, through which the Cugeegong winds from the eastern broken country, being joined on the western side of the plain by a creek of running water, proceeding from the northern rocky semicircle of hills. The Cugeegong here preserves an uniform width of twelve yards, the banks being low, muddy, and abounding in reeds; end thus it divides the heart of the flat lands of Daby from east to N.W. Daby, of whose fine pasturage much has been said at Bathurst, may be described as a tract of several miles in length, from S.E. to N.W., well covered with an abundance of grazing herbage, thinly wooded, having patches perfectly bare of tree or shrub, and of an exceedingly rich, black, moist, loamy soil, adapted to all the purposes of agriculture. Amidst these line patches of land there are portions somewhat elevated above the ordinary level of the flats, which are composed wholly of a loose deep sand, and productive (in conformity with the general character of the continent) of several curious and interesting plants. A double hill, bearing east from my tent, induced me, by its rocky aspect and elevated appearance, to ascend it, as well to examine its botanical productions, as to take a few cross bearings of the principal points of this irregular country. Several small kangaroos were skipping around the rocks, of which the higher parts of the hill are formed: they were, however, too active to allow us to shoot them, instantly retreating into the deep recesses of the summits. 24th April 1823 24th. My horses had been so negligently shod at Bathurst, that the shoes of two were falling off already; and I was obliged to despatch a man back to the settlement for a supply of spare shoes and nails. The man having returned to me on the afternoon of the 26th, the shoes of all my houses were secured, and some repairs to their pack-saddles being effected, I determined to proceed northerly on Monday, 28th. The exceedingly broken sub-mountainous structure of the country at N.E., N. and N.N.W., obliged me to commence my route from the plain of Daby, on the Cugeegong, considerably to the west of north, in part over a rising open forest land, tolerably well watered, lightly timbered, and occasionally interspersed with confined brushes. Availing myself of the country’s at length allowing me to travel north, I descended to a grassy valley, bounded by rocky hills of moderate ascent, which I traced, as it declined at north by west along the margin of a swamp; when, having effected ten miles, we halted in a vale beneath a part of the boundary hills, which was studded with limestone of an excellent quality. 29th April 1823. Throughout the following seven miles the country is a succession of wet valleys and dividing ridges; the former declining westerly towards the Cugeegong, into which it was evident that the waters that had collected and formed in each a swamp, drained the land at due north, and more especially to the east of that point, continuing broken and very irregular. The timber was the same as that of the river, with occasionally a few iron-bark trees, on the brushy descents from the hills. The general disposition of the leading ridges, at nearly right angles, with a direct north course; rendered the succeeding ten miles of the journey rather fatiguing, especially as the ascents to the summits of the intersected ranges were exceedingly steep, rocky, and otherwise difficult; and the interjacent narrow valleys continuing to dip westerly, showed us that their only point of easy access is from the bank of the river. An extent of apple-tree (angophora lanceolata) flats at length succeeds, with little or no interruption during four miles, to the base of a ridge of hills lying east and west; and although this part of the country abounds in kangaroos of large size, it appeared wholly unfrequented fay natives, no traces whatever (such as had been every where obvious on the trees in our previous route) being observed in the whole extent. This circumstance may, however, be reasonably attributed to the absence of water, none being found by our expedition until we had reached the foot of some rising grounds, bounding these flat lands to the north. The timbers are of apple-tree, iron-bark, stringy-bark, and box of ordinary size. The rocks were chiefly of a decomposing sandstone, with a pudding-stone studded with pebbles of quartz and jasper. A few detached blocks of: granite were also observed in a swampy vale. 30th April 1823. Upon leaving our encamping ground under a hill named Mount Burchell, and passing through a boggy tea-tree (melaleuca linariifolia) swamp, at the immediate base of the above-mentioned boundary hills, whose waters it receives; and upon penetrating thence about a mile through a body of honeysuckle (banksia integrifolia) brush, our route was effectually stopped by the broken precipitous aspect of the country. Perpendicular ridges, faced with rode, overhanging ravines of considerable depth, occupied a range of the compass from north to E.S.E. By dint of much labour we attained the summit of a grassy range at N.N.W. ; and I hence beheld not only the frightful irregularity of the country easterly, to whose verge we had approached, but had a bird’s-eye view of a very promising land, extending forty-five or fifty miles before us, to the base of a range of mountains lying east and west, and which bounded my view to the north; the intermediate country, although billy, appearing very practicable. Having taken a set of important bearings of points above the horizontal summit of this extensive range, which I considered might possibly constitute the grand southern boundary of Liverpool Plains,* we descended to a rich grassy valley winding to the N.W. ; and having traced it about four miles, creased a fine erode running to the westward, and forming the boundary limit, north of the extensive vale, which it abundantly and permanently waters. 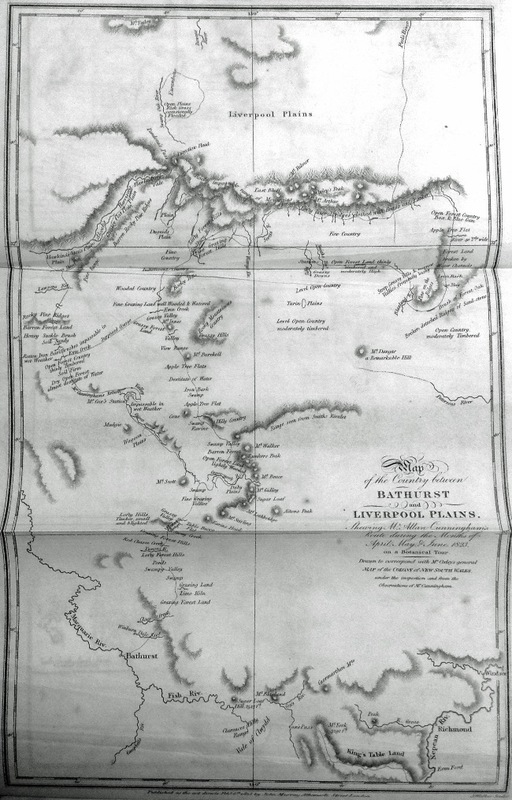 1st May 1823 May 1st Onward northerly, about three miles, once the ranges of hills, which were generally disposed N.N.W. and S.S.E., would not allow us to pursue a course better than N.N.W., we travelled over a continuation of low grassy hills and vales, thinly timbered with the usual species of eucalyptus; when upon penetrating through a narrow patch of iron-bark brush, the country at once became open, the soil rich and loamy, the general surface nearly level and but slightly wooded, enabling us to advance due north about five miles, with no other interruption than that of passing a large muddy watercourse descending westerly, which, although nearly dry and choked with reeds at this season, is evidently a considerable rivulet in the rains, as we gathered from the wreck of wood and stubble upon its banks. Another mile, north by east, brought us to the base of a rocky sterile range of bare hills, which appeared to extend themselves far to the eastward, whence another creek of like form and importance with that we had passed rose, receiving, as it advanced westerly, the drained waters of the broken rocky ridge at whose foot it ran. Although the country to the westward, in continuation of the thinly wooded forest land over which we had travelled, appeared perfectly open, moderately timbered, and every way adapted to travelling, as far as I could observe from the higher rocks of the bold range, its northern boundary, yet having already made more westing in my northerly course, in consequence of the general disposition of its main ridges, than I had originally intended, I penetrated through an uninteresting brush-wood of the irregularly-surfaced rocky ridge, and then proceeded N.N.E. about two miles over a diversified tract, in part a sterile siliceous scrub, connected with the ridge, and in part a patch of thinly wooded grassy flat, indifferently watered, and named by the aborigines Nandoura, which again immediately becomes invested with considerable sandy brushes of honeysuckle. 2nd May 1823 2d. From the small flat of Nandoura, an uniformly bad country extends nine miles, the greater portion of which consists of a level forest, intersected by deep, muddy, reedy creeks and stagnant holes of water, clothed with a small useless timber of box and blue gum; the soil being for the most part a stiff tenacious day, producing a wiry grass, interspersed with tufts of rushy and harsh plants of cypeaceæ, decidedly indicative of a permanently wet tract of country, from whose nearly level surface the rains are but partially drained. 3rd May 1823 Low stony ridges, covered with a very dense, lofty brush of underwood, and heavily timbered with tapering iron-bark, occasionally intersected our route. 4th May 1823. And as the country at length obviously declined to the N.E. and east, in the direction of some prominent points in the belt of mountains before us (of which bearings had been taken in the earlier stages of our journey), we fully hoped we were fast approaching the verge of a more open and improved tract of land, although at a lower level than the miserable desolate country through which we were penetrating. 6th May 1823. Pursuing a steady course N.E., we, in two miles, passed the confine of these uninteresting, unprofitable washes; and upon reaching the brow of the ridge of forest hills, we at once descended to a fine tract of good country, watered by a stream, whose winding channel could be easily traced by the particularly dark verdure of the swamp-oak (casuarina paludosa) on its banks, several miles in a N.E. direction. This small river (which I since learnt is the Goulburn of Lieutenant Lawson, whose marked trees we have repeatedly intersected in our route from the Cugeegong) presented to us at this period a stream thirty-six feet wide, flowing to the S.S.E. and S.E., within an ample outer reedy channel of fifty yards in breadth, which should seem to be filled in some seasons of heavy rains, wherein its waters are swollen to a perpendicular height of twelve feet above the present ordinary level, as appears by the lodgment of stubble in the branches of the stupendous swamp-oaks on its margin. The Goulburn evidently takes its rise in the south face of the mountainous ranges, which were distant from us from ten to fifteen miles, and which extend (as far as could be observed) from N.W. to about E.N.E. ; and the river having watered some beautiful open grazing lands on its left bank, winds S.W. to the rocky bases of the hilly ridges, by which we had descended to this truly fine country, and thence it takes a decided bend to the S.E. Its rocks are of a sand-stone, often coloured with oxyd of iron; and although fragments of a compact whin were met within its channel, they appear to have been rolled down from the lofty northern ranges in the vicinity. The large cod and bream (as they are called) of the waters falling westerly, which by reason of their voracious nature are easily taken by the angler, have not been observed in this river, the deep clear pools of which abounded with a short, thick, black fish, not to be tempted by our baits. Upon taking a retrospect of my irregular route (exceeding eighty miles) from the Cugeegong River to this stream, I would observe that, although portions in my latter stages are barren and unimprovable, the interjacent valleys, in the hilly part of my tour, afford excellent cattle pasturage, and will probably ere long be every way worthy of the consideration of the grazier, their respective points of entrance being evidently from the banks of the Cugeegong, or country in a north line from Mudgee. Goulburn River is distant, by the most practicable route, 125 miles north from Bathurst, and about sixty-five or seventy miles N.W. from the head of Paterson’s River (a branch of Hunter’s River), a good meridional altitude of the sun placing the ford, by which we passed it, exactly in the parallel of 32° south, its presumed longitude by estimation being 149° 54′. 7th May 1823. Along the left bank of this interesting stream, to the N.E., an extent of nine miles of rich grazing tracts meets the eye, consisting of clear open levels or small plains, and grassy hills of the most easy acclivity, which to the S.E. are bounded by ridges of forest land, thinly clothed with timber. The level tracts, immediately bounded by the river, occasionally break into small plains, whose areas comprise from 100 to 150 acres, clear of tree or shrub, and with the downs, or open gently rising grounds, furnish all the grasses and herbage of the Cugeegong and other western rivers, with the addition of a tall luxuriant species of danthonia, or kind of oat-grass, not remarked on other streams. The soil of these limited plains, or more level lands, is of a moist alluvial nature; whilst that of the small downs, especially near the southern extremity of this beautiful tract of country, is rich, loamy, and dry, possessing every advantage of local situation to call forth the diligence of the agriculturist; and being admirably adapted to the formation of artificial meadows for sheep, or wheat lands, as far as the boundary rocky hills to the S.E. Viewed collectively, the lands on Goulburn River offer an eligible situation for the establishment of a very profitable and convenient agricultural and grazing farm, inasmuch as it will be centrically distanced between the located pasture-lands on Hunter’s River, and our future stock stations on Liverpool Plains. Their only possible line of communication will, by reason of the structure of the country, be found to intersect the Goulburn, at or about the ford by which we passed that stream. 8th May 1823. Leaving Goulburn River, our course to the N.E. led us about seven miles over a part of the hilly ridge, forming the lateral branches of the northern belt of mountains before us, which appeared to extend very far to the eastward; and upon descending to a narrow, rich, grassy valley, we reached another water, having all the characters, in point of breadth, depth, velocity, and tendency, of the Goulburn. This small stream, which was discovered last year by Lieutenant Lawson during his tour with Mr. Scott, was then named the Wemyss, as a compliment to our Deputy Commissary-General, and together with a third stream, which I have now named Scott’s Rivulet, flowing through an open, clear apple-tree flat, about a mile east of it, rises in the northern barrier, and pursues a course through a very considerable level, wooded country to the S.S.E. and S.E. 9th May 1823. Continuing our route N.E. along the margin of Scott’s Rivulet, towards some very conspicuous points in the mountain barrier, distant about fifteen miles (of which bearings had been originally taken in the earlier stages of these journeys), the country again becomes hilly, and in other respects resembles the land to the westward of Wemyss’s River. It, however, becoming more lofty, irregular, and broken by deep narrow valleys, as I approached within five miles of a lofty point in this barrier of mountains, which I have named Oxley’s Peak, I deemed it prudent to halt, and having encamped, to examine the country around me from the most commanding eminence to which I could ascend, being fully satisfied that the distance to which I had penetrated from Bathurst, and the course by which I had conducted my little expedition, ought to have brought us to the verge of those large plains, to whose vast extent Mr. Oxley has in his Journal made special reference. 10th. It was with no small difficulty, and by a penetration to the centre of this formidable barrier, in which I crossed numerous streamlets proceeding from the many branching, steep, walled ravines around me, whose union formed the pretty rivulet which ran past our tents to the S.S.E., that I was enabled to reach the summit of a mount, which I have named M’Arthur’s (after my respected friend Hannibal M’Arthur, Esq. ), and which commands a most extensive view on all sides, amply repaying me for the fatigue experienced in attaining these pinnacles of the barrier. The country to the westward of our line of route from the Cugeegong appeared open, level, and moderately timbered, compared with the course I had pursued thence to Goulburn River; as did also the lands bearing from S.E. by south, to south, through which that stream, together with other waters which we had passed to the east of it, flows. The view between those points extends for a distance of between forty and forty-five miles to ranges of hills of ordinary elevation, which border upon that extreme point of Paterson’s River, situate N.W. from the point of Howe’s line of intersection, as seen in Mr. Oxley’s large chart, published by Arrowsmith. This entire extent of southern country, on whose ample surface small patches of plain were remarked, seemed as if it would afford to the farmers of Hunter’s River (upon passing the hills in their own immediate vicinity) every facility of communication with the N.W. interior by the way of Goulburn River. To the S.E. the land is irregular and ridgy; and thence more east to N.E., and even N.N.E., it gradually rises to a bold and mountainous feature, the declination of the country being uniformly south. Upon looking north and N.N.W., I was gratified with a most extensive view of those considerable plains, which have been in part the object of my search, whose expanse of cleared surface we should ere this have traversed, had the structure of the country been favourable to our northerly advancement. The greater body of Liverpool Plains hereabouts lie N.N.W., from which narrow lateral branches extend several miles to the east, between some detached woody ridges, variously disposed on the general surface. These strips stretch themselves again south to the immediate base of the barrier ranges on which I was stationed. A few detached mounds of conical and rounded figures were scattered on the greater or main patches of plain, beyond which the expanse of level country continues for a distance which I could not justly estimate, on account of the haze that hung over it. The rock of the more elevated parts of this mountainous range is a compact whin, generally disposed in horizontal strata, although, on the summit of the point whence I had taken a set of hearings of the country around, it assumed a basaltic form, being disposed vertically in cubical masses: the bases are sand and pudding-stone. Although there appeared no difficulty in passing along the winding declivities of the northern face of the mountains to a branch of Liverpool Plains immediately beneath me, the ascent, nevertheless, to this station from my encampment was so exceedingly steep and precipitous, as to render it totally impossible to lead my packhorses over them. I therefore determined (since the moderate appearance of the ranges east favoured my intention) to trace their south base in that direction in search of a pass, by which not only my horses, but the cattle and sheep of the farmer, might pass without danger, to those extensive pastures situate on their northern side. 11th to 16th May 1823. However, after pursuing an easterly course five days, in which we effected about thirty-five miles of very severe hilly travelling, all further advancing was totally stopped by the mountain ranges; and their lateral wings becoming bluff and fronted by perpendicular rocks, which formed a chain of deep precipitous ravines from N.E. to nearly S.S.E., an outlet to the flat southern country at south by west, and S.S.W., was the only direction left us to pursue. Exhausting as may easily be conceived to be a journey, whose course had uniformly met at right angles the lofty lateral branches of this collection of mountains, it nevertheless was not without its interest and importance; since it determined the extent northerly of the interjacent valleys, as well as the number, size and general appearance of the creeks or rivulets, which water them at so high a stage, immediately beneath the main barrier, and at only a mile or two from their origin. From Goulburn River to our most eastern point of penetration, no fewer than nineteen large creeks, or swamp-oak rivulets, very distinct at their respective points of rising, fall from the southern declivities of these mountain ranges, and with a considerable rapidity descend south and S.S.E. to the fine level country, which, from all the points in every stage of our eastern route, was seen at those bearings. Several of these waters constitute at once rivulets, which in some periods of heavy rains are swollen to a width varying from eight to twelve yards, the evidences of which were obvious in the stubble that had lodged itself on the branches of the swamp casuarinæ, which clothe and shade their banks; and of these one stream, proceeding from a point of the mountains to which several ravines converge, exhibited all the proofs of being, in the wet season, so considerable as not only to fill its ample channel (exceeding ninety feet in breadth), but to inundate the fine grassy open meadows on either bank. Heavy logs, the wrecks of successive floods, were heaped upon one another, seven feet above the then ordinary level, or two feet higher than the outer bank. Since the whole of these streams have one common tendency southerly, towards the extreme or western point of that trunk or main branch of the Coal River, which had been formerly intersected by Mr. Howe, in his journey north from Windsor, little or no doubt can exist of their constituting its principal sources, especially as the body of water, which the confluence of these rivulets might be supposed to form, agrees with the magnitude of Hunter’s River at that particular stage of its ascent. The principal valleys, which generally lie north and south, stretch themselves, from the immediate base of the mountain ranges, to the moderate country southerly, whence they ace easily accessible, are copiously watered, and furnish excellent cattle food, whilst their boundary hills afford generally an ample range of sheep pasture. Having failed in our attempts easterly, to discover any part of moderate elevation in this extensive line of bold mountainous land, by which I might have passed to the northward, and with a view of returning to my encampment on Goulburn River, whence I had determined to explore the continuation of this mountainous barrier westerly, I descended south, purposing upon reaching the open forest to pursue my journey west, at such a distance from the lateral grassy ranges proceeding from the mountains, as would enable my people and horses (both of which had been harassed in the course thus far to the eastward) to travel with ease and despatch. 19th May 1823. In about eight miles of progressive descent S.S.E. through a fine thinly-wooded grazing forest, we intersected a small river, formed evidently by the junction of several of the mountain streams, and winding to the E.S.E. through a beautiful flat tract, wooded chiefly with angophora or apple-tree. Its outer banks were forty yards wide, although the breadth of the stream at this season did not exceed sixteen feet, by an extreme depth of two fathoms; but as the land in its vicinity is entirely alluvial, and exceedingly rich, and the marks of floods were observed eighteen feet above the surface of the water, it is evidently swollen to a very considerable extent when heavy rains fall upon the mountains. Upon passing this stream at a pebbly ford, we continued our journey south about three miles, through a level grassy country, moderately wooded with several trees of apple and gum, and bounded to the west by a steep abrupt ridge of hills, extending south from the barrier ranges from which we had retreated; the country to the east, as far as S.E., still continuing in bold, lofty, hummocky ranges. In the hope that the steep rocky chain of hills westerly, which occasionally presented perpendicular stony heads to the S.E. would terminate, or become so moderate, that we might shape a direct course across the country to Goulburn River, we travelled as near its base as the small broken water-gulleys proceeding from it would allow. 20th May 1823. Journeying onward south about sixteen miles, through a rather indifferent country, occasionally breaking to an open grazing forest, and again becoming brushy, barren, and confined by much underwood, we at length were enabled progressively to advance west, by penetrating an abrupt, broken, narrow tract of country, consisting of bold steep ridges, bluff heads, and unconnected, irregularly-formed, stony elevations, separated from each other by small sharp grassy valleys, through which my pack-horses were able to travel without difficulty. Doubtless the whole once formed a line of connexion with the lengthened range of precipitous hills, whose base we had traced southerly twenty-five miles, and which at this stage terminated in perpendicular rocky crags of sand-stone, in a rapid state of decomposition. From some points of the rising grounds in the latter part of our route to this broken tract, I observed the considerable expanse of open moderately-timbered country, which we were leaving to the east and S.E., to be bounded in the far distance by low forest hills, and seemingly to afford every facility to a penetration to the coast line. 21st May 1823. Quitting these narrow passes, we traced a fine rich valley about three miles in a north-westerly direction, when we readied the bank of another river, flowing gently to the southward between the hills that bounded the fertile flat on which we had encamped. It is evidently formed of a union of several of the mountain rivulets, and although its stream did not exceed twenty feet in breadth, by the depth of one fathom, I could not but be forcibly struck with the obvious proofs of the immense floods that at certain periods descend from the northern ranges, and overflow the high outer banks, which are at least eighty yards apart. Heavy logs, the wreck of successive freshes, were heaped upon each other on the secondary banks of this river, whilst the stems of several sturdy swamp casuarinæ inclined so as to form an angle of about 45° with the bed of the river; and those, that had withstood the enormous weight and pressure of many terns of flowing water, bore on their limbs a mass of small timber and stubble at least twenty feet above the ordinary level of the stream. There existed no proof of these great floods occurring periodically. If they did, they would render a country apparently so intersected by mountain streams scarcely habitable. On the contrary, their occurrence seems manifestly rare, from the decayed appearance of the wreck that proves their existence at all. Large water-worn pebbles of quartz, jasper, jade, and their aggregate masses, were frequent in its channel, but no rocks of any description were observed on the higher banks, which, with the lands on either side, are of alluvial decomposition. This fine stream has received the name of Blaxland’s River; and, with others flowing from the N.W., in all probability constitutes in twenty miles Paterson’s River. 22nd May 1823. A series of unconnected rocky ridges of considerable elevation, and crowned with pine, lying in no regular order, and separated from each other by small grassy valleys, obliged me to pursue a north course, upon quitting our encampment on this river; and having with much labour accomplished eleven miles, by reason of the irregularity of the country, which often opened to fine clear grassy hills, we at length intersected a stream which, possessing all the character of its banks, current, and general appearance, induced me to consider it the Blaxland, ten miles nearer to its source. Upon tracing its banks upwards, I observed, in some deep pools, that were formed at the extremity of its narrow reaches, the same species of small fish that had previously been seen in the Goulburn. Our attempts, however, to secure them by the hook were here also unavailing, for on the least alarm they darted from our sight to the darker recesses, beneath the overhanging muddy banks. Upon resuming our journey, we pursued a course west from Blaxland’s River, through a moderately hilly tract of forest country and intermediate valleys, grooved with pebbly water-courses. Having advanced about five miles, several points of the mountain belt, set at other stations to the westward, were again fully recognized, and their bearings being again taken determined our position, in the line of route in which we were travelling. The country at length becomes more open, less woody, of a good loamy soil generally, and clothed with the usual grasses. The hills also are of a very easy acclivity, bounding rich valleys, which afford good cattle and sheep pasture. Continuing our route west northerly, over some low hills, which at length declined to swelling open grassy downs, we reached a large swamp-oak rivulet, winding round the base of a ridge of hills on its western side to the very open lower southern country. 26th to 28th May 1823. Upon the left bank of this fine limpid stream, which I have named Smith’s Rivulet, we were detained four days, in consequence of the alarming sickness of one of my people; and although my anxiety for his recovery, as also my general attention to him, in order to effect that recovery, did not permit me to proceed far from our encampment, to examine the country around, I nevertheless ascended a lofty ridge bearing about west from our tents, and took a set of valuable bearings to all the leading points on the northern ranges, having a tolerable view of the country around me. From S.S.W., by way of south, to S.S.E. the land appears (with the exception of a few low wooded ridges) perfectly level, for an estimated distance of thirty-five or forty miles, to the base of a long-backed range lying east and west, and being evidently connected with the broken mountainous land in the vicinity of Daby, upon the Cugeegong River. The open downs, or grassy easy declivities, which extend along the east bank of Smith’s Rivulet, are traced, round the bases of the hills whereon I was stationed, to the level southern country, where they are circumscribed by the land becoming wooded; and beyond this, on the general level, are observed two small plains, lying relatively north and south, each appearing about a mile in diameter. The mean of four meridional altitudes of the sun placed the situation of our encampment on Smith’s Rivulet in 32° 2′ 6″ south latitude, the presumed longitude being about 150° 24′ east. 29th May 1823. Resuming our journey to the westward, we passed along the foot of some forest hills to a wide thinly-wooded valley, extending several miles N.W. and north, towards the base of the mountains, from which a large stream, similar to Smith’s Rivulet, descended, meandering through the bosom of the very pretty vales, along which we travelled upwards of two miles. A hilly irregular tract of forest country succeeds about five miles, whose higher ridges are rocky, and occasionally covered with a brush of plants, uninteresting even to the botanical traveller. 30th May 1823. In order to avoid the more difficult lofty ridges in our former route from Goulburn River, we commenced our journey from our encampment on this stream, two points to the south of west, and having travelled about eight miles of generally a hilly irregular country, we intersected our old marked trees, near the open flats of Goulburn River, by which we returned to our original position on that stream, after an absence of twenty-four days, in which period I had ascertained the nature and importance, to the grazier, of the country a degree to the east and north from the base of an impervious belt of mountains, towards the western extremity (at present known) of Paterson’s River, in a south direction; as also, the number and magnitude of the several streams that (rising in the south face of those barren ranges) descend and flow through a declining southern tract of country, and which, from their tendency, are (on reasonable grounds) presumed to constitute the principal sources of the trunk or main branch of the Coal River. 1st June 1823. Although my provisions were very considerably reduced, on my return to our encamping ground on this river, as were also the conditions of my people and horses, and although I ran a risk scarcely warranted by prudence, since I could not foresee what swollen waters might interrupt our quick return to Bathurst; nevertheless, conformably with the plan I had digested, upon failing in the discovery of a passage north to Liverpool plaids in my route easterly, I reduced the weekly ration of myself and people, determining to employ a period of seven days in exploring, in a north-westerly direction, the continuation of these mountains, which appeared to extend their blackened ranges westerly for an unlimited distance. 2nd June 1823. Having given the people and horses a day’s rest, we proceeded upon our new route to the N.W. over a rising open forest, but observing, upon an advance of a mile, a most evident break of the main ranges of hills at north and N.N.E., I was induced to alter my course to that direction. A route thus commenced I was enabled to maintain with little variation during the succeeding eleven miles, through several narrow but rich, well-watered valleys, and over some very moderately-rising minor hills, without much labour to my pack-horses, all of which had become thin and debilitated. 3rd June 1823. The summits of the leading hilly ranges appeared very rocky, and thinly timbered with stringy hark, box and blue gum; whilst their acclivities, from the grafting valleys which they bound, were well covered with a grassy herbage, constituting dry walks for sheep. At length, an irregular series of lofty mountainous ranges, peeping over one another northerly, as far as the eye could see, and extending from the eastward towards the N.W., obliged us to climb some steep hills, and pursue a western course across some narrow valleys and lofty forest ridges, lying north and south, at right angles with that route. 4th June 1823. Upon accomplishing a laborious journey, though not exceeding seven miles, a lateral branch of the mountain range trended to the S.W., and being faced by a very narrow deep ravine, whose bottom I could not perceive, totally prevented our further procedure in that direction. From the point at which we had halted, we observed the country from east to north, and thence to N.W., to be a vast collection of bold lofty ranges, occasionally in series one behind the other, and again divided and terminating in steep precipitous heads, which overhung deep yawning glens and sharp rocky ravines. In this route westerly, we passed the lofty ranges which separate the eastern and western waters; for, upon descending to their intermediate valleys, we remarked the rivulets which ran through than to incline most decidedly to the S.S.W. and S.W., being the first streams we had observed to have that tendency during the last four weeks. Seeing, therefore, the country from east, by the way of north, to almost west, was closed against us, and that there appeared no probability of discovering, by further perseverance westerly, any passage through this formidable barrier, I had almost determined to quit its blackened ranges altogether. However, upon observing some patches of open plain, bearing S.S.W. in the only direction left us to pursue, I resolved to descend to them, and from thence I should be able to see distinctly that tract of country, over which I could proceed a day or two longer with tolerable ease to my pack-horses, and which would best meet the views of my expedition prior to my return to Bathurst, a route I should be obliged very soon to pursue, as well on account of the condition of my men and horses, as of the very reduced provisions which we had to subsist upon. 5th June 1823. I accordingly conducted my party through a fine rich valley, watered by a creek, issuing from the ravine, and wooded with apple-tree, blue gum, and swamp oak, and having traced it about seven miles, it broke into small open plains perfectly clear of timber, which lying N.N.E. and S.S.W. appeared to extend between some rising grounds three or four miles. The steep range of forest hills that limited the valley on its western side, upon extending to this strip of plain, which I have named Duguid’s, becoming exceedingly low and moderate, induced me to advance to the westward over it, through an open grazing forest, which soon brought me within sight of another heavy; bold, lateral range, constituting the boundary of a valley, much more ample at its entrance from the forest, and more promising, in its trending, to the object of my research, than any recess towards this belt of mountains that we had yet explored. The aggregate body of these mountainous ranges evidently inclined to the N.W., and their respective principal branches descended generally S.S.W. parallel to each other, forming valleys more or less spacious, through which the waters rising in the southern declivity of this belt escape to the interior, bearing S.W. and W.S.W. from us. The difficulties with which we had to contend in every stage of our journey, more especially during our near approaches to these mountains, considered with the observations I have of late made on the arrangement of their main or aggregate, body, and its respective parts, fully convinced me that the only practicable mode of continuing their examination, with a view towards discovering, a passage through them to the northward, would he by travelling on the broad base, formed generally in the lower country at the southern extremities of their lateral branches, exploring at each stage those large valleys that open upon it, and which, by their general tendency, might afford the hope of ultimate success. Thus impressed, and deeming the valley south of us well worthy our examination, I continued our journey to it over a fertile flat of apple-tree, the soil partly of a loose, rich, vegetable decomposition, and partly of a still alluvial nature, particularly along the margin of a fine brook, which ran through the vale from the N.E. Upon an inclining plane, we were enabled without difficulty to trace this valley to the N.N.E. about eight miles; when finding it became very contracted and sharp, by reason of a converging disposition of its boundary and other minor ranges, I was induced to halt and ascend a high point of the western range above us, being folly satisfied, from the northing we had made since we left Goulburn River, that we could not be many miles distant from the southern limit of Liverpool Plains. To my utmost gratification, upon tracing the line of mountain ranges, which continued very far to the N.W., a very considerable depression in the bade of the main ridge, distant about three miles, afforded me a clear, although limited, view of a part of the open plains north of this extensive barrier; on which I immediately recognized and identified several detached round mounts, that had been previously seen from the summit of a lofty pinnacle (Mount M’Arthur) situate in these mountains to the eastward of us. 6th June 1823. Having again taken their bearings, as also those of several points around me, I descended to my people, and lost no time in shifting my encampment to an open valley immediately at the base of the mountains, and within two or three mites of this apparently practicable passage to the northern country. 7th June 1823. Upon proceeding to examine it, I found that, from the level of the valley, the ascent through a close, lightly-timbered forest was exceedingly gentle and gradual to the highest part of the gap or pass, which was distant from our encampment about two miles; and the declivity on the northern side of the ridge, although less moderate (its face being grooved by small water-gulleys) was nevertheless found practicable, and not to exceed a mile to the open wooded country at its base. This was observed to be timbered with large and stately box, and watered by a rivulet, which meandered through the forest northerly, forming in its progress the western boundary of a considerable extent of plain, about eight or nine miles north from the highest part of the pass, which on either side is overhung by bold, lofty heads of the mountain range. Having directed a line of trees to be marked from our encampment through the passage to the verge of the nearest plain, I climbed to the summit of the eminence on the east side of the pass, and thence had a most beautiful and extensive view of the country before me. From the northern base of these mountains, a level, open forest land extending from W.N.W. to north, to the foot of a long-backed range lying east and west, and distant sixteen or twenty miles; its ridge towards the western extremity being exceedingly hummocky and irregularly pointed. On the eastern side of this woody country is distinctly traced, by the line of swamp-oaks on its banks, the small rivulet which rises in these mountains and runs direct north, its line of course forming, with the forest, the western verge of the nearest or most southern extensive patch of clear plain, whose visible extent easterly from my station was limited to the N.N.E. by detached, steep ridges of hills, between which, however, on their northern sides, these cleared levels evidently stretch themselves, and communicate with several patches perceived under some rising grounds as far to the eastward as N.E. This southern plain, whose breadth to a slight boundary line of apple-trees on its northern side is estimated at ten miles, presents a considerable expanse of brown grass and herbage; and, excepting a small clump and a few scattered trees on its south-western angle, is perfectly clear of brush or shrub. Upon extending the view beyond it north, the plain or open level country continues very many links, its general surface being sparingly studded with a few detached mounts, or an occasional line of small trees, through which a few sharp points were barely discernible on the distant line of horizon. It was a subject of regret to me that the exhausted state of my provisions, as also the generally debilitated condition of my people and horses, would not permit me to advance northerly to explore these vast levels. I was therefore obliged to content myself with the simple discovery of a practicable passage through a bold range of mountains to them, but for which those unlimited, seemingly abundantly watered, grazing levels would be entirely closed against us from the southward. 8th June 1823. A good altitude of the sun at noon gave me for latitude of my tent in the valley 31° 43′ 45″ south, my longitude by estimation continuing about 149° 30′ east. 9th June 1823. In my journey to Bathurst, from which the difference of latitude alone gave me a distance exceeding 100 miles, I fully purposed intersecting the Cugeegong River as near the stock-stations of Mr. Cox or Lieutenant Lawson, as the structure of the intermediate country would permit me, since in the event of any failure of my provisions that might take place from detention by swollen riven in my route, my party might procure a sufficiency of aid from those establishments to carry them forward to the southern settlement without distress. We therefore proceeded on our homeward-bound route along the vale, which we found declined to the S.W., and consisted of rich grazing flat, watered by a swamp-oak creek, and bounded by a steep ridge of hills on its S.E. side, the mountain-range overhanging it to the N.W. At about eight miles the vale, which had not throughout its extent from the pass exceeded a mile and a half, at length opens to a clear patch of plain, extending to the west along the base of the mountainous range about two miles and a half, and skirted over its S.E. side by a moderately-timbered forest of apple-tree, box, and some white gum; the creek which had, in its progress through the vale, received some small addition to its stream, being traced immediately under the range on the west verge of the beautiful open level tract, which I have named Harrison’s Plain. Perhaps no situation, from its local advantages, is more eligible for a general grazing establishment than Harrison’s Plain, inasmuch as it not only offers its open downs, which comprise at least a space of cleared land exceeding 700 acres, free from wet bottom, and therefore favourably adapted to sheep-pasture, but it commands a very beautiful and extensive cattle range, exceeding eight miles throughout the vale, to the pass over the mountainous range to Liverpool Plains. 10th June 1823. Desirous, under our present circumstances, of pursuing as direct a route southerly as the trending of the ridge of hills to the eastward would allow us, we stretched across part of the plain to the skirts of the wooded land, and thence advanced to the south and west, about eight miles, through an uninteresting forest, occasionally rising to low rocky ridges, covered with a scanty underwood. At length a strip of iron-bark brushy forest obliged me to direct out course more to the westward, when we immediately descended to a fine open wooded flat, connected with those fertile grazing lands which appear confined to a narrow limit between the line of forest which we have penetrated, and the foot of the ranges N.W. from us, which still continue to stretch themselves very far to the westward southerly. Upon accomplishing fourteen miles from the northern extreme of Harrison’s Plain, we again halted upon a creek, which, receding from the foot of the western range, assumes at this stage the character of a deep-banked, but narrow, rivulet. A level, clear tract of land, devoid of trees, between it and the above-mentioned range, about a mile wide, and extending north and south three or four miles, I have named Alcock’s Plain, in compliment to another gentleman of His Majesty’s Treasury, that to the northward bearing the name of one of its secretaries. The barrier of mountainous land which has extended from the pass thirty miles to the S.W. in one uninterrupted impassable range, continues to the west an estimated distance of forty-five or fifty miles, and constitutes the northern boundary of a very considerable tract of level, open, wooded country in that direction. To the west of Aiton’s Plain, and simply separated from it by a line of apple-trees, is another of somewhat larger dimensions, which I have named Hawkins’s Plain, upon whose north side the creek that has followed us from the northward runs, continuing under the mountainous range to the westward. Upon looking to the S.S.W. and S.W., the country, although broken and ridgy, appeared very practicable for the prosecution of our journey. Since, therefore, we had already gone farther to the west, in consequence of the disposition of the ridges of hills, than I had originally proposed, I rejoined my people, and continued our journey to the S.S.W. about six miles, over a very barren, irregular forest, interspersed with dense patches of brush, especially on some lateral, low, rocky ridges, connected with the pine-range still bounding us to the S.E. 12th June 1823. A low, heavily-timbered flat, abounding in pools of water and bog-plants, and evidently subject to occasional inundation, brought us, in another mile from the dry barren grounds, to the margin of a small river, whose muddy steep bank, clothed with tall reeds, in many places concealed the deep waters which ran through its channel to the west. Tracing its right or north bank to the eastward, about a mile and a half, over a fine, rich, alluvial forest-land, timbered chiefly with apple-tree and blue gum, and affording an excellent grazing run for cattle, we at last succeeded in fording to the opposite bank, and thence we were enabled to shape a more direct course towards our point of destination than we had hitherto been enabled to do. This small river, which, from its relative position, may be presumed to be formed by an union of three northern swamp-oak creeks, that were intersected previously to the discovery of the pass, is about twelve yards in breadth, of various depth, not exceeding two fathoms at the time we passed it; but subject in seasons of heavy rains to be flooded to a height of ten feet, when the whole of the forest-lands, from its banks to a pine-ridge a mile distant, is laid under water. This river is called Pubo-batta by the aborigines. I have, however, called it Lawson’s River, after the commandant of Bathurst, who first intersected it in January, 1822, to the westward of the point at which we had passed it. Continuing our journey S.S.W. we passed through an open forest-country, productive generally of an useless, ordinary-sized timber, of apple-tree, box, and some blue gum, and very indifferently watered, since in the space of five miles a very shallow siliceous water-channel alone interrupted the dull level sameness of the forest, in which I remarked a few detached small pools of discoloured water. 13th June 1823. A rugged bushy pine-ridge, lying east and west, and extending in such direction as far as we could perceive through the timber of the forest, at length interrupted our progress southerly. However, having passed it, with some difficulty, to a low declining valley, and finding some stagnant pools of water resting on the stiff tenacious clay of the country around, I encamped, as much to obtain some bearings from a rocky head of the pine-ridge, as to give my debilitated pack-horses (almost wholly without shoes) a little rest, although in a place affording them very indifferent pasture. Having taken bearings of a hummocky, lofty range of hills at S.S.E., and apparently distant from twenty to twenty-five miles, which I satisfactorily recognised as being situate near Mudgee, on the Cugeegong River, we were induced to prosecute our journey with as little loss of time as possible, especially since the louring, unsettled state of the weather had rather impressed me with the apprehension of being detained by the rains. 14th June 1823. As some heavy showers began to fall, we were able to effect only three miles and a half, through a continuation of uninteresting open forest, furnishing a heavier timber than the lands we have passed, but equally destitute of living streams. A few scattered native cypresses (callitris pyramidilis) of blighted growth, together with occasional clumps of honeysuckle (banksia integrifolia), tended in some degree to diversify the too prevalent sameness of the scenery around. Continuing our journey S.S.E. about three miles, we entered an extensive iron-bark forest, the deep siliceous soil of which, resting on a stiff clay, being rendered extremely rotten and boggy by the showers that had fallen the preceding night, showed us that after two or three days of heavy rain, this tract of country would be totally impassable. However, having struggled through its confined brushes, we readied a somewhat improving tract of land, mote open, less timbered, and of a firmer surface, but still very badly watered; only one creek of any importance, filled with a stagnant-putrid water, being met with in a route of about twelve miles and a half. This brought us to the neighbourhood of some elevated lands, observed from the pine-ridge I had ascended, one stage to the southward of Lawson’s River. Observing some rocky hills bearing from south to S.W., we prosecuted an irregular route easterly over some rising grounds, and along a ridge of broken, low hills, upon which were scattered large blocks of granite, whose decompositions being washed into the narrow intermediate valleys, formed a base, over which our horses travelled with confident firmness. Having effected about ten miles, we descended a ridge S.E. to a very wet valley, when, to our surprise, we crossed several recently trodden cattle-paths, which, as they led over some rocky hills to the east, I did not deem it prudent to follow. Their discovery, however, satisfactorily proved to me our near approach to the Cugeegong River. We therefore continued a S.E. course, but had scarcely proceeded a mile, before I had to regret leaving the higher grounds for the valley, although the former were broken and rocky, and consequently injurious to the ill-protected feet of my pack-horses. The rains which had recently fallen had so super-saturated the deep soil, that my horses were sinking in above the knee in these boggy grounds, thus rendered by the partial rains as soft as a quick-sand. At length we managed to struggle about two miles to a broad but shoaly creek, evidently the channel by which these wet lands are drained into the Cugeegong; and upon crossing its stream, which flowed to the westward, we halted, both man and horse being fairly worn out with the excessive fatigues of the day. 15th June 1823. Calculating that a course south, about four or five miles, would bring us to the river, we quitted our fires on the creek at an early hour; but had not proceeded a quarter of a mile over the open forest, before our hones fell under their small loads in the boggy soil, obliging us to return to the firmer grounds on the creek. Most unexpectedly, as we were tracing it westerly, we overtook a stockman of Mr. Cox (an extensive grazier on the Cugeegong), who was in search of strayed cattle, and from him we obtained the information of the discharge of the creek into the river about three miles below his master’s station. Learning that every part of the forest-land south from us was perfectly impassable, by reason of the heavy rains that had lately fallen upon the country around, we continued winding along the creek W.N.W. and N.W. about five miles, when it united with the Cugeegong at a beautiful, clear, fertile flat, named Gurran by the aborigines. We continued our journey south up the bank of the river, over rich alluvial flats, covered with strong grasses and luxuriant nutritious herbage, constituting a permanent pasture for cattle. The late rains had swollen the waters of the Cugeegong to a level with its extreme banks. The declivity of country nevertheless was so exceedingly moderate, that its current was barely discernible. This exordinary fulness of the river afforded me but little hopes of being able to cross its stream until its waters had considerably subsided. However, upon arriving at the part immediately opposite the hut and stock-yard of Mr. Cox, we were shown a good ford three feet and a half deep, by which we safely crossed this considerable stream, and encamped at that gentleman’s station. 16th June 1823. Here I rested my people and horses from the fatigues of their journey, and we procured such comforts, particularly vegetables, as this recently-formed establishment afforded. I have now traced my long-protracted journey throughout all its stages, to the left or south bank of the Cugeegong River, having ascertained (for the information of the colonial government) the structure and agricultural importance of the country situate at the spring-heads of those streams which constitute Hunter’s River, the character of the lands westerly to the pass, through a formidable range of mountains that forms the southern boundary of Liverpool Plains, as also the route by which the only line of communication can be opened to them from the settlement of Bathurst; the measured distance between these open tracts of country being 160 miles. The mean of four meridional altitudes of the sun, taken during the period of four days’ rest at this station, places it in lat. 32° 32′ 54″, my estimated longitude being 149° 39′ east. 20th June 1823. We pursued our journey to Bathurst up the left bank of the Cugeegong, which consists chiefly of rich alluvial flats, wooded generally with the apple-tree, with little or no interruption by rocky, brushy patches, about twenty-four miles S.E. to the point at which the beaten path intersects the river. These fine grazing grounds vary in depth to the boundary ranges from one to three miles, as the hills approach or recede from its banks, and occasionally open into plains perfectly clear of timber, and therefore affording excellent situations for stock runs. 22nd June 1823. Heavy, clouded weather, proceeding from the southward, with every indication of a long continuance of rain being about to meet us, I lost no time, upon reaching the beaten route to Bathurst, at the point where it intersects the Cugeegong, in advancing to the settlement, and we arrived there on the evening of the 27th, showery weather having prevailed ever since the 20th, on which day we resumed our journey from Mannar, the native name of Mr. Cox’s stock-station. 27th June 1823. Upon our arrival at Bathurst, we learned that rain had fallen during the last six weeks on the plains, and that the Macquarie River had been flooded so considerably as to inundate the wheatlands on its upper bank, a circumstance never before witnessed since the establishment of the settlement.